It’s the year 2018 and there is an API for just about every action that your app has to perform. Unfortunately, a lot of API services treat webhooks as afterthoughts and that requires developers to spend significant part of their time glueing individual APIs together and, whenever things stop working, untangle them to find the source of an error. Our newly rebuilt webhooks buck this trend. Native features such as environment filters, secret headers, and payload transformations enable a very wide range of use cases without the overhead of building and maintaining an in-house integration layer. To reduce the setup time for popular integration scenarios even further, we have added a library of built-in templates to the webhook section inside the web app. 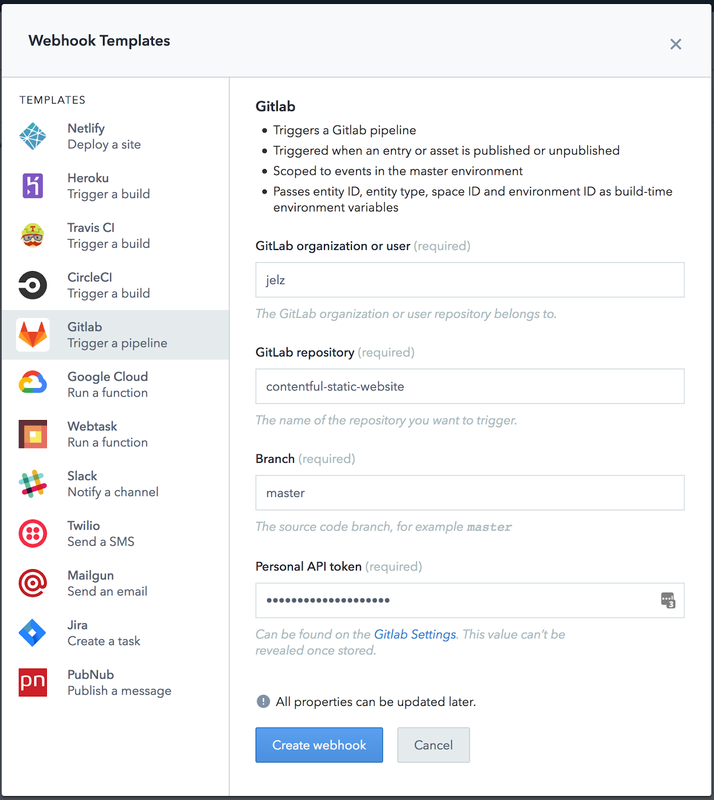 The templates make it possible to connect your space to popular third-party services without writing code. Notify your editorial team of published articles via Slack, add your latest changes to the CI/CD pipeline, or automate a repetitive content creation step - these are just some examples of the things our customers do with webhook templates. Not sure where to get started? A recent blog post offers an overview of popular workflows, while Agolia tutorial explains how to add a search capability to a Contentful-powered website. AWS services are some of the most popular destinations for the outgoing webhooks created by our customers — this prompted our product teams to focus on the experience of using Contentful alongside AWS. While both platforms have been built as API-first services, authentication processes mandated by the AWS platform required development teams to build and maintain custom API gateways, adding manual development effort and increasing the perimeter for security attacks. With the introduction of support for the AWS Signature Version 4 authentication process and payload transformations, development teams can connect directly to AWS services. To accelerate this further, we added S3, SQS, and Lambda to the library of built-in webhook templates. The tutorial on automatically adding watermarks to images is a great example on a use case that leverages these integrations. This advanced feature is available to customers on our enterprise-grade contracts. The original team behind GraphQL at Facebook described GraphQL technology as a data API "powerful enough to describe all of Facebook," while remaining easy enough for regular product developers to learn and use. Our early alpha users have confirmed just that: GraphQL API takes minutes to learn, is easy to build upon, and results in faster-running apps. Contentful's implementation comes with all the features developers expect, including GraphiQL support, powerful filtering capabilities, and ample getting started guides. 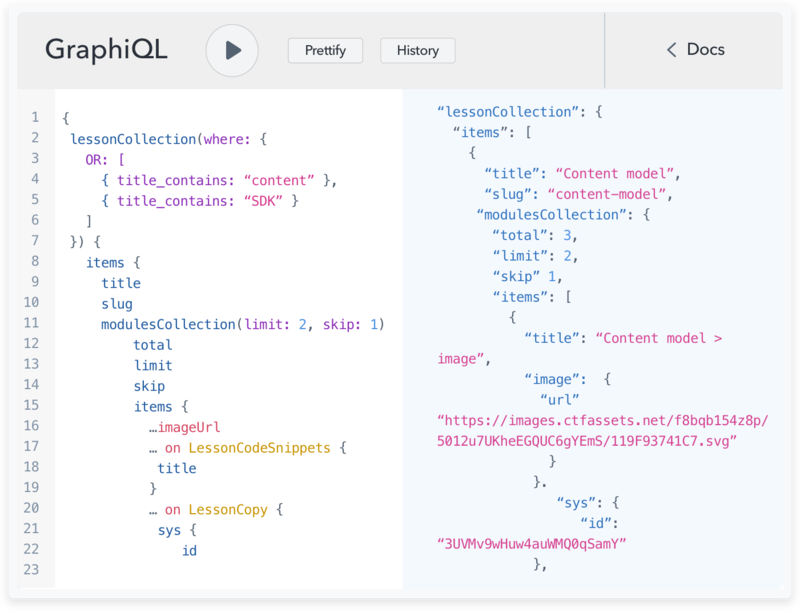 The GraphQL API is now in beta, offering a fully functional equivalent to the content delivery API (CDA) and content preview API (CPA). As we battle-test our delivery infrastructure, we are starting with the GraphQL API beta on Large and Performance space types, with plans to make it available more broadly in the future. March 1, 2017 was a dark day for devops team all over the world. A typo by an Amazon developer performing a routine maintenance task cascaded into a four hour outage of the AWS S3 web hosting service. Since the region affected by the outage was used by hundreds thousands of websites, it had a ripple effect on the Internet. Everyone from Apple to Adobe, Expedia, Mailchimp, Slack and SiriusXM were affected. The option of deploying content APIs to multiple regions prevents similar outage from affecting your business in the future. In a nutshell, multi-region delivery infrastructure (MRDI) adds an additional layer of redundancy by distributing traffic between two regions (us-east-1 and us-west-2); if one of the regions experiences an outage, the traffic is automatically redirected to the healthy region. The main benefit of this setup is that it guarantees customers up to 99.99% service availability, a widespread technical requirement for companies in regulated industries. To find out more about the technical details and availability of multi-region delivery infrastructure, please contact the sales team. Red tape can be a show-stopper when adopting new technologies in large organizations, so we want to help pioneering teams minimize the friction. Since PoC spaces come free-of-charge (albeit for a limited time period), they offer customers with long-term contracts a viable option of prototyping technical solutions, onboarding new teams, and testing premium features without going through a procurement process. Qualified teams can also provision PoC spaces right in the web app, cutting down the time needed to spin up a new space to seconds. For those of you interested in trying PoC spaces, your customer success manager can provide more details on the limits, availability and what steps to take at the end of the trial period. The complexity of building digital products inside enterprise organizations can be daunting. Development teams have to contend with legacy tools, content silos, legal requirements and elaborate internal processes, as they are pressured to deliver results faster and across more touchpoints. Our latest product release brings features designed to help large organizations to succeed at these tasks. They are ideal for building modern websites and mobile apps, and help new development teams get up to speed quickly—turning Contentful into the content infrastructure platform for your entire organization. Getting started with Contentful is both free and quick—just head over to the sign-up page and create your account. You can also read our features page to discover more about what we can do for your organization and its workflows.